Still-a-state rep Marty Walsh appeared yesterday on Channel Five’s On the Record. The candidate who, in debates and interviews, was unprepossessing at best, often awkward with rhetoric trending banal, is looking more and more mayoral. His presentation was comfortable, and he came across as focused and transparent even while skillfully avoiding being pinned down on specifics (as in, what percentage increase he’d support for the police contract). Walsh seems committed to inclusivity. He said all the right things about looking both inside and outside the system to fill key positions, including police commissioner, school superintendent and BRA chief. He promised a smooth transition from the Menino administration, with which the incumbent pledges to help, and named three preliminary opponents to his transition team. Walsh’s reach to the business community is enhanced by the idea that the business community goes beyond the John Fish (Suffolk Construction), Jim Davis (New Balance) and Gary Gottleib (Partners Health Care) to include small business owners in the neighborhoods. He garnered strong support in communities of color, who are now the majority in Boston. People from all walks of life seem to find him authentic and a builder of bridges. They provided his margin of victory. 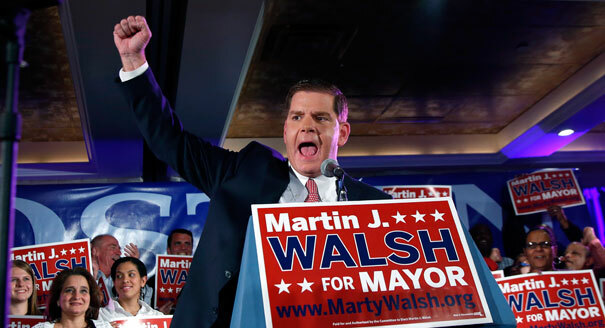 Despite outside groups’ efforts at class warfare on behalf of Walsh, the mayoral race was largely civil, with few policy differences between the two candidates. John Connolly’s election night concession speech couldn’t have been more gracious. The feeling the morning after was not so much a hangover as a sense that we were Boston Strong in politics as well as in sports and post-Marathon resilience. Nearly 150,000 voters turned out, more than 40 percent and way more than expected. Participation was across the city. The two top vote getters in the at-large City Council race were an African-American woman and an Asian-American woman, a better nod to the city’s shifting demographics. In short, election 2013 seems to say we are one Boston, that while problems remain on racial, economic and educational disparities, the new generation is poised and capable of tackling those gaps as one city not the self-defeating warring camps of earlier generations. That’s the promise of Marty Walsh, and also the challenge he must meet. This entry was posted in Politics, Uncategorized and tagged Boston mayoral election, Boston police contract, Channel Five, Gary Gottleib, Jim Davis. New Balance, John Connolly, John Fish, Marty Walsh, On The Record, Partners Health Care, Suffolk Construction, turnout. Bookmark the permalink. Im no expert, but I suppose you just crafted the best point. You certainly know what youre speaking about, and I can actually get behind that. Thanks for staying so upfront and so genuine. Walsh is a Member of the Massachusetts Legislature, an elected Representative since 1997. It is truly disrespectful to refer to a man of his stature as a “wannabe”, especially when he is replacing an “accident”; Menino was a sign holder and driver for Kevin White, and after Flynn was posted to the Vatican as Ambassador, we were saddled with a moronic (see bambino casino deal) thug (ask those that have been punished for opposing him) for two decades. Had it not been for the $1 million a year personal City Hall PR Propaganda unit, compliance and complicity at the Globe and Herald, Mayor Medici never would have lasted this long. Walsh is a BC graduate, so it is in fact the present Mayor who is the wannabe.